I know it’s sort of odd but I have never visited Asheville so of course I haven’t been able to try their great beer or food, firsthand. 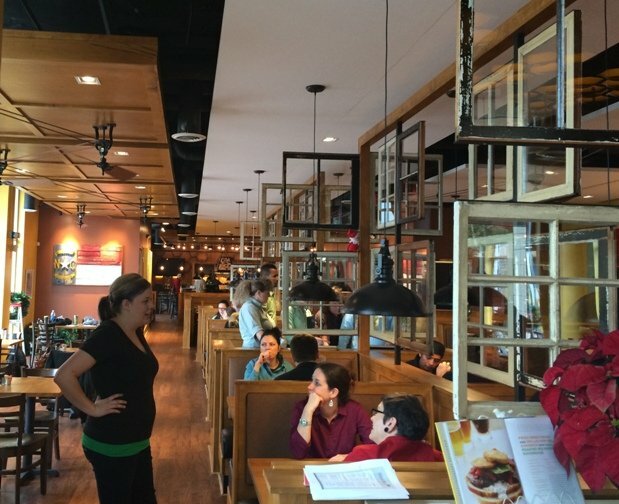 So when the buzz started in Raleigh over the new Tupelo Honey Cafe near Cameron Village, I was caught pretty much unaware. 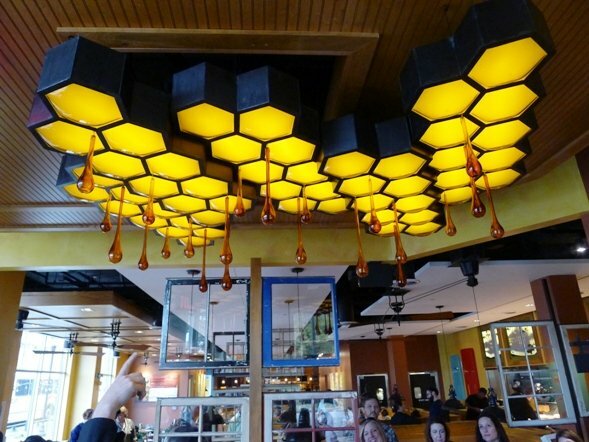 Thankfully, an invite to their media day and preview dinner saved me a trip to the AVL and I got to experience what makes Tupelo Honey Cafe so popular! A first visit on media day to check out their space and then a second visit to experience their food and service. And you can sum it all up in three words: Great Southern Eats! 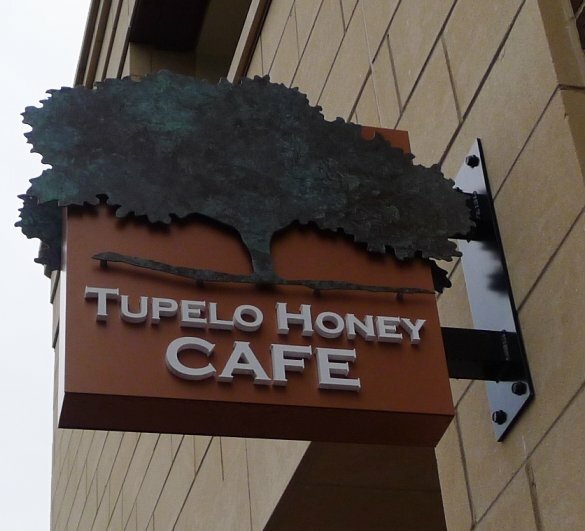 First thing you’ll notice from the outside is the great location Tupelo Honey Cafe holds down on Oberlin Road. On the corner of Oberlin and Clark, kitty-corner to the newly opened Faire Steak and Seafood. Given its corner spot, Tupelo Honey Cafe has a great sidewalk patio with lights strung out overhead and a gas fireplace in one patio section. For media day, we were served up some biscuits, jam and their signature rosemary peach lemonade, delicious! 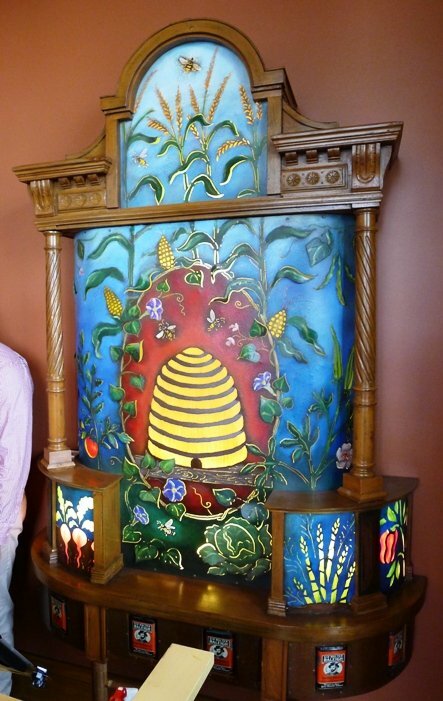 Inside you’ll find an even more impressive presentation in homage to Tupelo Honey Cafe’s roots. 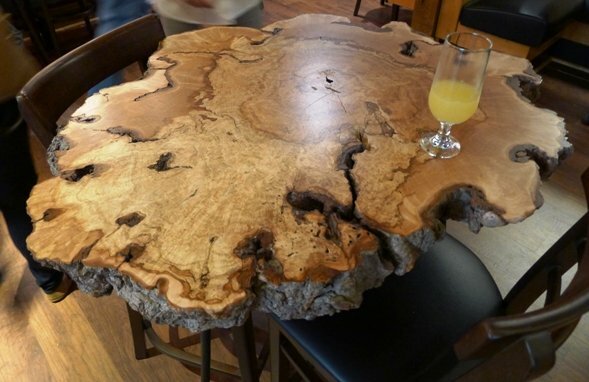 Weathered window frames hang between booths, a beautiful polished tree trunk table in the lounge area, low-hanging retro lamps hang from overhead. There’s a translucent honey-combed glass installation overhead at the entryway complete with blown glass honey drops, super impressive. And then a beautiful bar in back along with a clean open kitchen to the side where you can see all the culinary action ensuing. 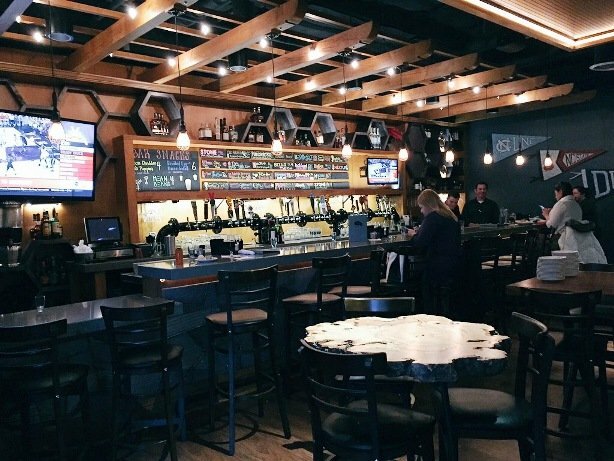 There’s obviously been a ton of money spent decorating this location and it’s a wonderful combination of rustic, modern, stylish and just right lighting. It’s a touch busy but all pretty pleasant to the eye. Media event attendees all received the latest Tupelo Honey Cafe cookbook which created a lot of anticipation for their upcoming preview dinner! 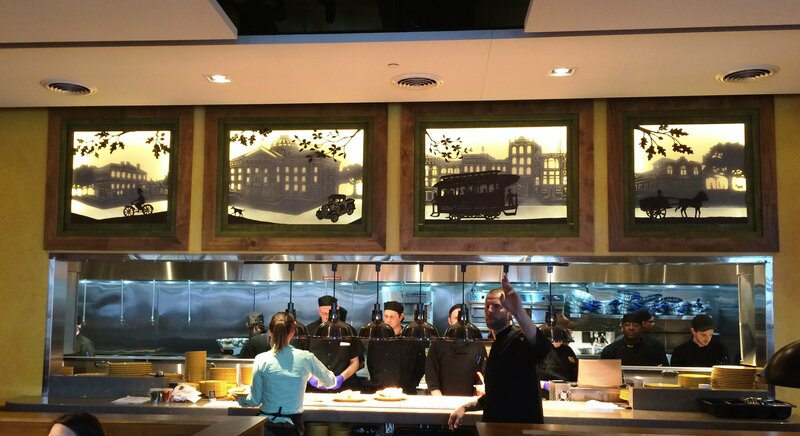 So on the Saturday before their official opening (12/1), I hoofed it over to Tupelo Honey Cafe. The place was glowing with lights out front and a light crowd already inside. I’m early so I grab a beer in back and while they will have a decent offering of NC beers, tonight they’ve only got two on tap right now. A Tupelo Honey rye ale is fitting to get tonight going! After a short wait we’re brought out to our table and handed a menu for the preview dinner. One appetizer to be shared, an entree each and a shared dessert should keep us quite happy. While they’re running a limited menu for tonight’s shake-down run, there’s plenty to choose from. We order up the Appalachian egg rolls, a shrimp and grits, crab cakes along with banana pudding to finish up the meal. While we’re waiting I check out the cocktail menu and they do have some nice option, all classics (margarita, Tom Collins, G&T) done with a twist, nice job Tupelo Honey Cafe! 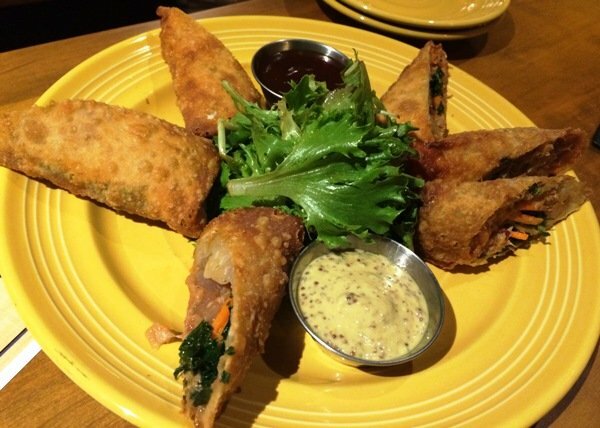 Our Appalachian egg rolls arrive, six pieces served with barbeque sauce and dijon mustard, yum! They are REALLY well done with a crisp, non-greasy crust. Nicely stuffed with barbeque, greens, onions and carrots, I could eat a large plate of these rolls. 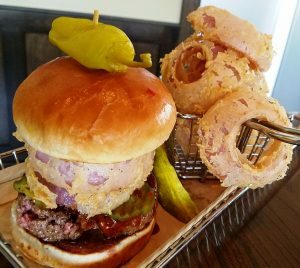 Most of the appetizers at Tupelo Honey Cafe are in the $8 to $11 range and cover fried green tomatoes, fried okra and other Southern classics. 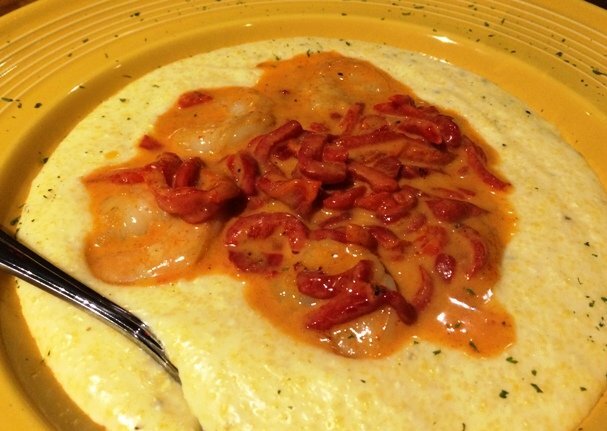 Moving on to the entrees, my shrimp and grits is a large plate of 7 plump shrimp, creamy goat cheese grits and served with a red pepper sauce. This plate of shrimp and grits are up there, possibly the best I’ve tried in the area and a large portion which makes me a happy boy! The grits are light on the goat cheese and has a balanced texture between creamy but shows off some of the corn grain underneath. The shrimp are perfectly tender and the red pepper sauce light and flavorful. Loved this plate but admit I wouldn’t have minded a bit of hot sauce shaken on top! 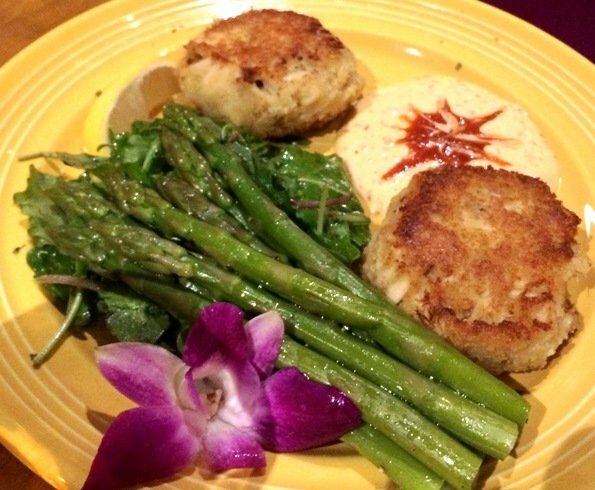 My tablemate’s crab cakes look excellent but I don’t sneak a taste. Entrees at Tupelo Honey Cafe range from $14 to $20 with a couple hitting the high $20’s, about par for the course and for this area. And finally we move on to dessert, a cold banana pudding with the requisite vanilla wafers on the side. Very nicely done, would love a dollop of home-made whip cream (I think it was canned whip cream) but otherwise it was an excellent finish. 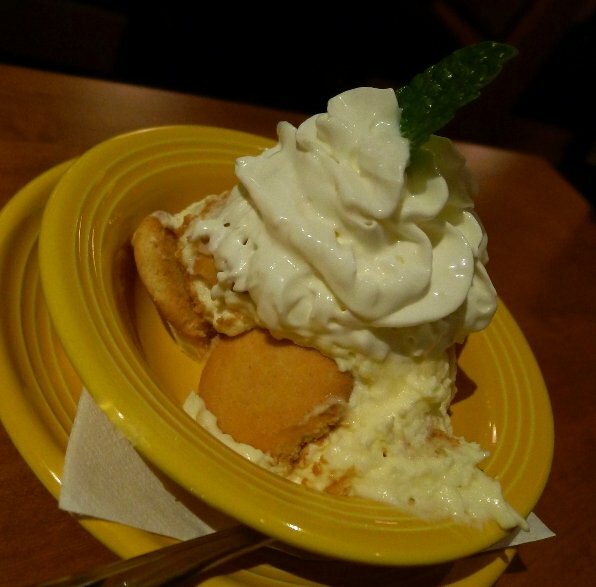 With only two dessert choices I’m thinking Tupelo Honey Cafe will do a great job with both ($5.50 – $6.50). All in all, I was very much surprisingly impressed with Tupelo Honey Cafe and want to say thank you for your hospitality and delicious eats. I had heard different things from my network but feel that the wait and anticipation for Tupelo Honey Cafe is well-deserved, The space is very warm and beautiful with great accent pieces representing their history and Southern heritage. The food is Southern but tweaked a bit for more modern palates and shows off some creativity. And it’s all quite delicious. The drink and beer list will also keep the Raleigh crowd happy given higher expectations for cocktails round here. And the patio will be awesome once the weather warms up, for afternoons or evening. 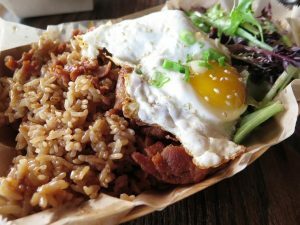 I’m pretty sure Tupelo Honey Cafe will be a huge hit here in Cameron Village and I’m looking for a return visit to try more from their menu. Parking is available in the 401 Oberlin parking structure with entry from Stafford or Clark Avenue. Best of luck with your grand opening and for those looking to visit in the near future, please be patient. While they’ve got a well-trained staff, every restaurant goes through growing pains and I would expect them here. But yeah, it’s worth the effort and for those lovely Appalachian egg rolls, bon appetit!